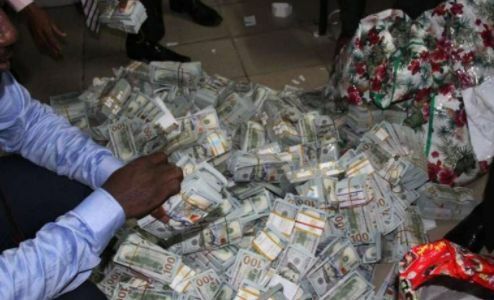 The Economic and Financial Crimes Commission says the “young man” who blew the whistle on the massive stash of money recovered from an apartment in Ikoyi, Lagos, is now a millionaire. The acting chairman of the commission, Mr Ibrahim Magu stated this in Vienna, Austria on Thursday, spokesman of the EFCC, Mr Wilson Uwujaren, said in a statement. Uwujaren said Magu spoke at the ongoing 7th Session of the Conference of States Parties to the United Nations Convention Against Corruption. On April 7, EFCC operatives broke into a four-bedroom apartment on Osborne Towers, Ikoyi, and pulled out $43m, £27,800 and N23m stashed in a wardrobe. The EFCC said the discovery followed an operation triggered by a whistle blower’s alert received by its Lagos office. Uwujaren quoted Magu as saying that the whistleblower was already a millionaire by virtue of the percentage he was officially entitled to. “We are currently working on the young man because this is just a man who has not seen one million Naira of his own before. “So, he is under counselling on how to make good use of the money and also the security implication. “We don’t want anything bad to happen to him after taking delivery of his entitlement. He is a national pride,” he said. The EFCC boss called on Nigerians who want a positive change in the country to take advantage of the whistle-blowing policy announced by the government early this year. He noted that aside from contributing to the eradication of corruption, potential whistleblowers also stood to “benefit from the illicit acquisition by the looters”. “So, we encourage more whistleblowers to come forward with genuine information that will lead to recoveries from looters of public treasuries. “That is part of the ways we can put an end to the looting madness in the public sector. “When they know that they have no place to keep the loot, as all eyes are on them, they will find looting of public treasuries unattractive, ” Magu said. It would be recalled that on June 7, a Federal High Court sitting in Lagos ordered the final forfeiture of the money to the Federal Government. So, the whistle blower is entitled to his percentage.